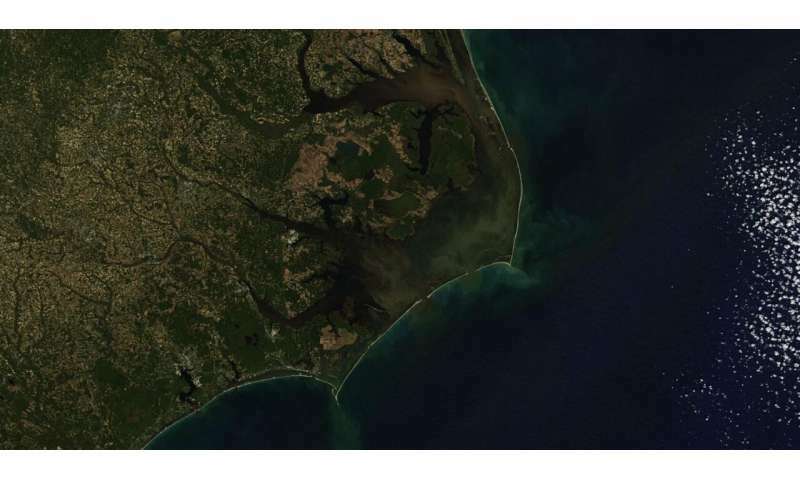 Chris Osburn is an associate professor of marine, earth and atmospheric sciences at NC State. His latest work, published in Geophysical Research Letters, looks at the effect that large, destructive storms – such as 2016's Hurricane Matthew – have on carbon sinks and on the amount of carbon dioxide (CO2) being released into the atmosphere around North Carolina's Neuse River estuary and Pamlico Sound. The Abstract (TA): Let's start by defining what you mean when you talk about carbon sinks. Osburn: A carbon sink is a place where CO2 is stored as organic matter on land, either in soils or in wetlands, or in coastal water such as estuaries. CO2 is a natural byproduct of existence, and it's released when organic materials decay. For example, leaves that fall from trees are a source of organic carbon that can decay to CO2, but if the leaves fall and get buried in soil or fall into water in a wetland, they get stored there – the material doesn't decay and release CO2. That storage is a carbon sink. TA: How does carbon stored in a sink get back into the atmosphere? Osburn: When soil erodes or wetlands get flushed out, the organic carbon stored there gets into a river system and then moves into an estuary or sound. Once that happens, there are two major ways that it can be removed. First, the organic material is food for naturally occurring bacteria. Just like us, bacteria release CO2 when they breathe. When there's more food available, there are more bacteria, and so more CO2 gets released. The other way that CO2 gets released is by sunlight. Much of this material, the organic matter, is colored, so it absorbs sunlight, which chemically converts a portion of that carbon back into CO2. TA: What are the effects of major storms on this process? Osburn: Big storm events flush the stored organic carbon downstream, where it's exposed to sunlight and bacteria, activating the processes that release CO2 and changing a system like the Pamlico Sound from a sink to a source. Our research shows that in the six weeks or so after Hurricane Matthew, the Pamlico Sound produced about 25 percent of its annual CO2 output. What's alarming on one hand is that you can mobilize and move a lot of this material in just one or two events per year. TA: How much CO2 are we talking about? Osburn: We estimated that the Neuse River Estuary and Pamlico Sound released nearly 79,000 metric tons of CO2 in the two months following Hurricane Matthew. That value equals the annual CO2 released by about 17,000 cars. Thus, these individual events can be significant; research prior to ours has found that one or two events per year can wipe out the entire CO2 uptake capacity of these coastal environments. Osburn: Earth's climate is controlled in part by its energy balance, which is strongly influenced by CO2 in the atmosphere. Extreme weather events have the potential to dramatically increase the release of CO2 to the atmosphere from coastal environments that might otherwise trap that CO2, so it's important to understand how the climate system interacts with the carbon cycle. Where the organic carbon comes from on land appears to be important, as well as how it's being released – by bacteria or sunlight. Our next steps will be to study the rates at which sunlight and bacteria are releasing the carbon stored in this organic material back to the atmosphere as CO2. Are we losing one of our biggest carbon dioxide sinks?